Hai-Ping Cheng is a physicist, but her research crosses the boundaries between many sciences, such as chemistry, materials science, and engineering. A theorist, she works on understanding the properties of matter at the atomic and molecular level and connects these properties to important nano-scale and macro-scale behaviors. Her work is highly computer intensive, so she uses state of the art hardware and develops methods, algorithms, and computer programs to use it efficiently. These programs are then distributed via open source so that they can be used by other researchers in related disciplines. The Department of Energy supports Cheng’s research on the interface between nano-size and bulk matter and between organic and inorganic materials. The aim is to successfully simulate, using computer programs, observed phenomena, and then extend these programs to predict which other processes can be realized. It is clearly much more efficient to be able to perform these “experiments” by computer before they are attempted by the experimental physics community. 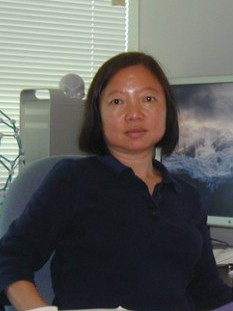 Cheng also has support from the NSF to develop innovative computing techniques to allow multiple parallel codes and date flow among codes. These techniques are being applied to understand the interface between quantum and classical regions for such systems as water and silica. The NSF also funds the Laser Interferometer Gravity Observatory (LIGO) experiment, one of the forefront scientific endeavors of our time, and Cheng has recently become a member of the LIGO Scientific Collaboration. Her research in this area is not to study gravity itself, but to understand the optical coatings of the mirrors used as part of the experiment apparatus. This involves having knowledge of the thermal motion of the materials at the atomic level. Her techniques are also applicable to biophysics systems, such as the growth mechanism, structure, and properties of bio-mineral and bone. As all inanimate objects and animate beings on earth are composed of atoms and molecules, the science of the two are closely related when studied at the smallest length scales.